Adagio Beach is a pet-friendly ocean-front home with an elevator, screened-in porch, private beachfront heated pool, and 6 bedrooms including 4 King Gulf-front bedrooms, each featuring its own private bath and flat-screen TV. 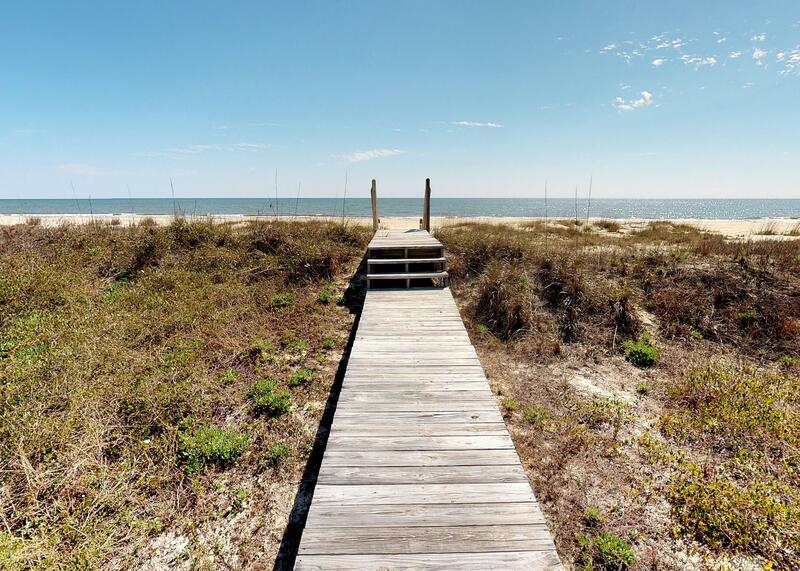 This home is spacious with more than 2,700 square feet PLUS 3 beachfront decks. • Stairs to pool and beach access. • First floor open deck has awesome views of beach. • A gate on this deck prevents pets and children from accessing the stairs. 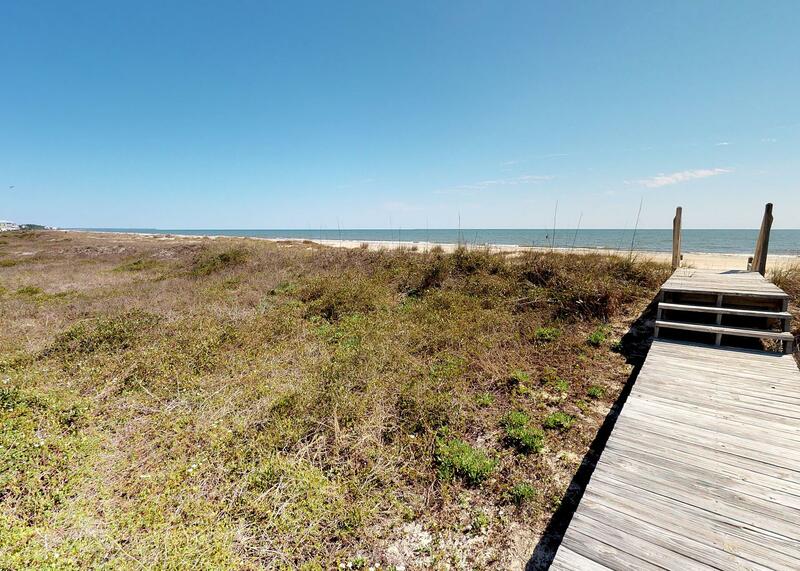 • Open living area with upscale kitchen, expansive views of the beach and walkouts to the screened porch. • Fully equipped gorgeous kitchen with granite counter tops and beach view. • Granite island with 4 stools is great for casual dining or communing during food preparation. • Laundry room with full sized washer and dryer plus second fridge located just off the kitchen. "We came to this vacation rental last November and loved it. We were fortunate to be able to come back again for another week this month. This might be the most amazing spot on earth. The sunrise is as beautiful as the sunset with a full view of both from the balconies. We sat on the balcony every day and watched the waves wash in and out. A school of dolphins played in front of the house. It felt like a private beach. The house is equipped with every comfort of home. If you should forget a book to read, there's a fine selection in the bookcase. Movies for adults and kids. Beach toys. Nothing’s been forgotten. The rental agency was great, very communicative and accommodating. The toiletries were upscale. There’s nothing that wasn't five star. It was truly a little piece of heaven. Thanks for sharing this home with us. " "This home was above and beyond our expectations. Well designed space for our entire family and grandchildren. The kitchen was very well stocked with needed cooking utensils. I appreciated reading a previous review of the pool being smaller than the picture shows, but we totally agree that it was perfect and adequate for all the small children AND adults. Sunset Reflections was very responsive to a couple of maintenance issues that arose and addressed them in less than 24 hours. This was the first time we've stayed on a beach that allowed vehicles on the beach, however, we found them to all be courteous and careful. Beautiful home and we hope to plan another stay in the future. " Beautiful home, tons of privacy! "We were looking for a beachfront property with a private pool and elevator that was pet friendly and would fit a large group comfortably. This house was PERFECT for us. One of the members of our group is wheelchair-bound, and although this home is not ADA, he was able to get around almost everywhere comfortably. That was a major factor in our stay! Even the one time we had issues with the elevator, Sunset Reflections sent someone out to fix it in less than half an hour. Throughout the booking process and during our stay, they were very attentive to our needs. The house and property were beautiful - the quality of everything was impressive. We will definitely stay here again!" 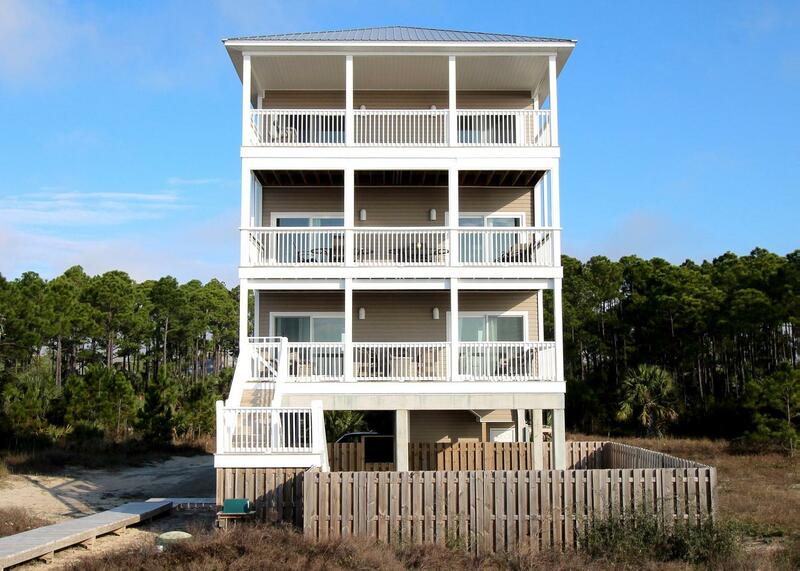 "We truly enjoy the Cape San Blas area! We like the tranquility and the beauty. We found this home last year, and we decided to return again this year. It is perfect for our family. This home has all the amenities you need, and it's beautifully decorated. Plenty of space. We enjoyed the decks, especially the screened deck. Also, the grand babies spent a lot of time in the swimming pool. The elevator is a plus. This was the deciding factor so our parents (82 and 83) could join us. This home is just steps from the white sand and blue waters. This year our group consisted of 7 adults, ranging from 30-83, and 2 children, 2 and 4...four generations, plus our dog. The proximity of this home is great! Being close to Port St. Joe, Cape San Blas and Apalachicola is a plus. We were close to excellent restaurants and retail shopping. We have had the pleasure of working with Sunset Reflections for at least 4 years now. Sunset Reflections makes planning our vacation so easy, and we appreciate that. Their website is very easy to use. This home is highly recommended by our family to anyone looking for a wonderful vacation spot. " "This house is amazing! We stayed with our young children as well as another family with young children and two sets of grandparents and there was plenty of room for everybody. We loved the layout of the house with the main floor separating the two floors with bedrooms. It allowed each family to have there own private space. My kids absolutely loved the bunk room. The location of the house is amazing. I don't think it would be possible to be any closer to the beach. The beach was very quite. Only a few people scattered here and there up the coastline which is exactly how we like it with young children. They had all the room in the world to play without us having to worry about their safety or them bothering anybody else. They loved the tide pool that was left for them to play in each morning after the tide went out. The views from the house were amazing...just so close to the water. I can't say enough. We loved our stay here and would definitely recommend this house!!!" "Great beach house. Nice and clean and right on the beach with a pool. " "Family went to Cape San Blas for its annual vaca together. We rented Adagio Beach house and was very pleased when we opened the door and saw how lovely the home was. Was a little disappointed in the size of the pool but the "little" guys were about the only ones wanting to use the pool so that turned out perfect. However, if you have more than 4 small children, it might be a little crowded. Loved the kitchen and how well it was equipped! And we certainly loved the elevator and planked boardwalk to the beach. Those will be must haves from now on.....thank you Adagio for a great vaca with the family!" "We've been vacationing on Indian Pass for almost 20 years - Adagio Beach is the perfect house for a family beach vacation! My husband and I took our kids, grandkids, and my mother and had a wonderful week. With 4 beachfront king bedrooms, everyone felt as though they were in the "master suite." The house was beautifully furnished and very well appointed. The kitchen has most everything you need - and drawers and cabinets are labeled so you don't have to constantly hunt for things! (For instance, coffee lovers will find two coffee makers, a French press and a moka/espresso pot.) We didn't leave the house/beach all week except to fetch groceries/ice or pick up dinner from the Raw Bar, which is only about a quarter mile away (we could hear their live music at night while we had a fire on the beach). We didn't feel the need to go anywhere else! Oh, and the weather was great every day we were there, too. The Sunset Reflections staff did a great job; we'll use their services again. Did I mention that I didn't have shoes on until Thursday? It was my turn to fetch dinner." "Adagio Beach far exceeded our expectations. GREAT home with wonderful beach views! We had everything we needed with renting beach chairs/umbrellas. Small pool was perfect for a 2 y.o. and the elevator helped tremendously with luggage/supplies! We'll definitely return!!" "Our trip to Adagio Beach was a last minute decision because my brother and I saw my mother's health decline. She had been battling cancer and it unfortunately spread in the weeks before we left. She grew up on the beach and it was always a source of peace for her. So, we rented this beautiful house and told our family to throw all other plans out the window and show up. We had a wonderful time. My mother was very weak but was able to still see the water from her bed when she rested. The elevator allowed her and my 97 year old grandmother to share this trip without worries of mobility issues. The house is stunningly beautiful and exceptionally appointed. My mother was also able to bring her little fluff ball dog who she adored. She enjoyed every moment of our trip and later told us she will treasure our trip forever. My mother passed away about two weeks after we returned home. I will always be thankful for giving my mother something to look forward to in her last days. This house felt like home while we were there and I hope to return with family in the future." "A great way to start retirement and get away from the cold winter! We spent 3 weeks at this home walking the beach, shelling, shopping and dining in the local towns. This home has it all. It is well equipped with everything you need and more. The beds were amazingly comfortable and its so nice four of them faced the ocean. It was light and bright, perfect for escaping the dark winters and the decor is really fresh, charming and felt beach like, which coming from the North is exactly what is needed. Thank you for being dog friendly! Carlos wore himself out on the beach everyday and was so happy he did not have to go outside in zero degree weather. Also the elevator was a great help for bringing up our bags and groceries. Thank you for sharing your lovely home!" "We wanted to rent a place just to be able to relax, look at the ocean, walk on the beach, cook good meals and rest well. This house provided all that and so much more. It is one of the most thoughtfully appointed rentals we've ever used. Along with that, it is tasteful, comfortable, spacious and beautiful. " "We have been spending Thanksgiving week on the Gulf for the past ten years with our extended family. This ranks among the best of the many places we have rented. The kitchen was by far the best equipped of any and the beds were the most comfortable. Having a heated pool for the children was fantastic. Being this close to Indian Pass Raw Bar was also great. I really can't find a downside to this rental and recommend it without reservation." "Had a wonderful time, just loved the house!!!" "Our family of ten had a fabulous stay at Adagio Beach. The home is well furnished to have plenty of room for folks of all ages. Everything was clean and well maintained inside and out. Our boys fished daily off the beach and caught a variety of exciting fish. The pool was perfect for our little ones to enjoy as well. We hope to stay here again." "The house was fabulous and the location was fabulous - we love Indian Pass! The house had everything we needed to make our stay enjoyable. We would all go back to Indian Pass and would use Sunset Reflections as our rental company." "We had a great week staying at Adagio Beach with the family. Can't wait to book our next trip!" "The house was beautiful. The beach was amazing. Planning next years vacation right now!!" "We (all 12 of us) were delighted with the Adagio Beach. Plenty of room for everyone and right on the beach. Couldn't get much better. We would suggest that those renting be made aware of the policy of no antibacterial soaps of any kind due to the septic system. We did not so had to go out and purchase soap." "We love Cape San Blas and Indian Pass. This marks our 8th visit and Adagio Beach was the best house yet. The location was perfect, the house was practically brand new and so well cared for. The beds were wonderful and the kitchen a pleasure to cook in and so well equipped. Of course the views were awesome. Sunset Reflections is the best rental company I have ever worked with for vacations. The staff was terrific again. Thanks." "Our family, ages 9-75, enjoyed a family vacation at Adagio Beach. We prepared a typical Thanksgiving dinner----all the needed equipment was provided in the large, well appointed kitchen and a long table made room for seating the family. All the adults had rooms with king beds and wonderful views of the ocean and the sunset. A great week was enjoyed by all---even our dogs! " "This was our second stay at Adagio Beach and it once again proved to be the most relaxing, wonderful get-away for our family! We have seven children ranging in ages from 16 years old down to 1 1/2 years old. My parents came with us and we all enjoyed plenty of room and all the comforts one could hope for while on vacation. The weather was perfect during our early November stay. The boys caught an abundant amount of fish, especially reds and even reeled in several sharks- on purpose!!! The children enjoyed the heated pool every day. We took several trips into town, both Port St. Joe and Apalachicola, which were fun and rewarding! We truly appreciate the attention and quick service provided by the Natural Retreats staff throughout our week. Adagio Beach is true to its name...slow tempo...and just what we needed!" "Visited Thanksgiving week and weather was great. Whole family had a great time." "We just returned from an extended family vacation and had a wonderfully relaxing time. Loved sitting on the balconies, listening to the waves each night!"